If you’re in the market for a high volumeID card printer without a large footprint, you need the Evolis Primacy ID CardPrinter with ethernet–especially if you need personalized cards of highquality. The Evolis Primacy ID Card Printer prints fast and is powerful andefficient so you spend less time issuing cards and more time on the things thatmatter. And it does all of this in a compact shape. When you need to print large batches of personalized cards, Evolis Primacy ID Card Printer can churn out personalized color cards up to 225 cards per hour for single-sided and 140 cards per hour for dual-sided. And the large capacity card feeder and output tray both hold 100 cards, meaning you don’t need to keep refilling the printer as often. You get all of this functionality and high capacity in a compact footprint. The Evolis Primacy ID Card Printer features a 300dpi photographic resolution and edge-to-edge printing that gives you the best print quality. And with its enhanced graphical processing, you get a real-life depiction of the images in high definition, including more precise monochrome texts. Both the card feeder and hopper are accessed directly from the front, meaning you can keep an eye on the printing. Evolis High Trust print ribbons install very easily and are automatically recognized by the printer. 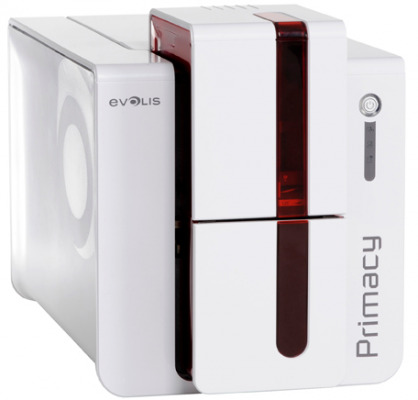 And you have options for interacting with the Evolis Primacy ID Card Printer: you can access the printer using the optional LCD screen, or you can use the Evolis Premium Suite software to control the printer directly from your computer screen. Recycled materials in the manufacturing of printers and consumables wherever possible. Compact and lightweight designed printers to reduce CO2 emissions in transportation and packaging. Reduced power consumption through a very economical hibernation mode. If you see your needs changing in the future, you can easily activate the dual-sided printing option on-site and when you need it. Or you can upgrade your Evolis Primacy ID Card Printer with magnetic stripe, contact, or contactless chip encoders whenever you want. To maximize the quality and durability of printed cards, the lifespan of the print head and the overall printer reliability, use Evolis High Trust ribbons.